This is a recurring TFM series. Catch up with all installments of Celebrity Composite Photos by visiting the archive. Gene Wilder is an absolute legend. He’s known by all ages for his role as Willy Wonka in Willy Wonka & the Chocolate Factory, but older folk (and film buffs, and people with good taste in cinema) also thoroughly enjoyed his roles in Blazing Saddles, The Producers, Young Frankenstein, and plenty of other masterpieces. From humble beginnings in Milwaukee, Wisconsin, Wilder (born Jerome Silberman) made his way to the silver screen through hard work and the help of Hollywood renaissance man Mel Brooks, who would become his comedic partner and one of his closest friends. But before all that, Wilder attended the University of Iowa, where he was initiated as a brother of Alpha Epsilon Pi. 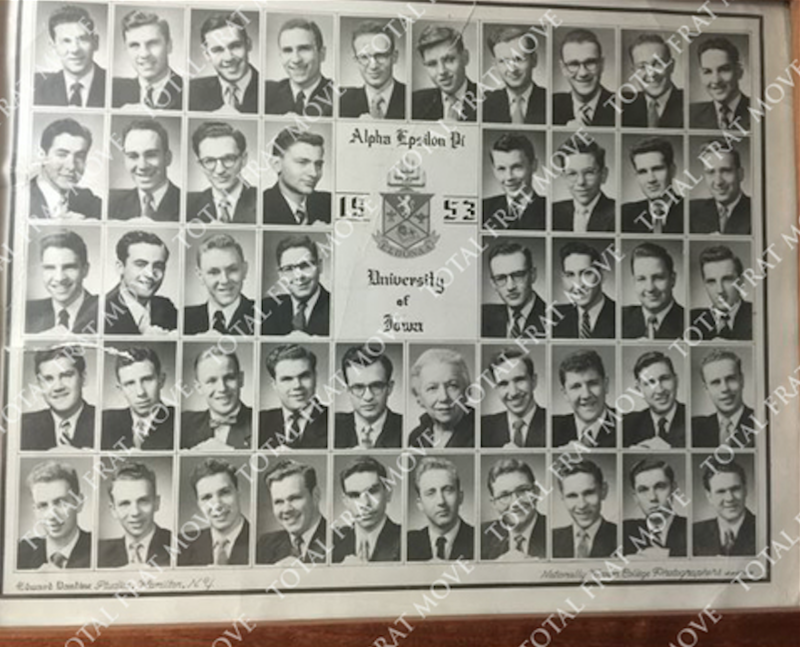 Here’s the 1953 composite from the Iowa AEPi chapter, which was sent to us courtesy of Brennan Wolf, a TFM reader whose grandfather was Gene’s fraternity brother. Wilder’s photo is situated in the bottom row, sixth from the left. The world lost a comedy genius and an all-around great guy on August 29, 2016. Rest in peace, Gene. Check out some more celebrities’ fraternity composite photos below. If you want to knock off every SJW on your college campus, show Blazing Saddles at one of those campus movie nights that only geeds attend anyways, and then watch all of their heads explode throughout the course of the movie. He’s actually bottom row, 5th from the right. I’d trade Gene for Tyler Perry in a heartbeat.